After spending a memorable night in the funky town of Paia in Maui, it was sadly time to leave. I will miss you Mopsey Kalua Pork Pizza and Sandy Beach Coconut gelato. But, on the flip side of the coin we were departing to drive the Road to Hana, one of the best things to do in Maui. The Road to Hana, also known as the Hana Highway, is a picturesque (and very curvy) drive along Maui’s northeastern shore. 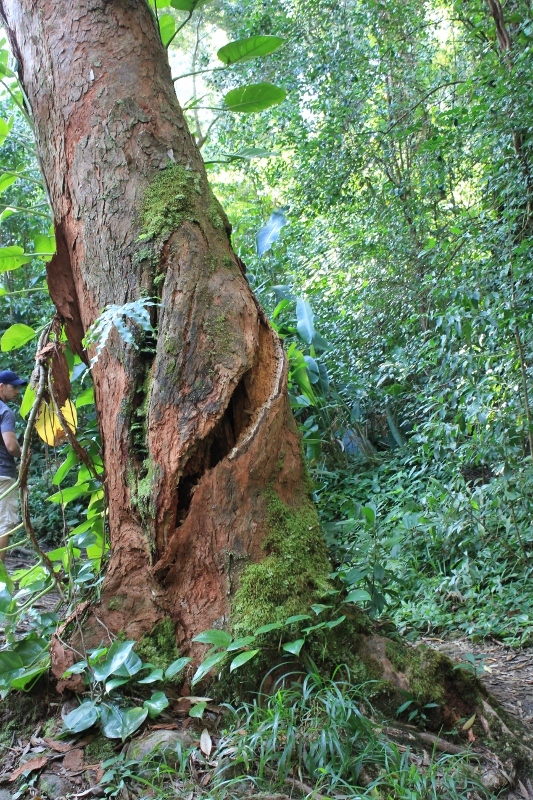 It is loaded with hundreds of hairpin turns, cascading waterfalls, a bamboo forest and dozens of beautiful things to see. 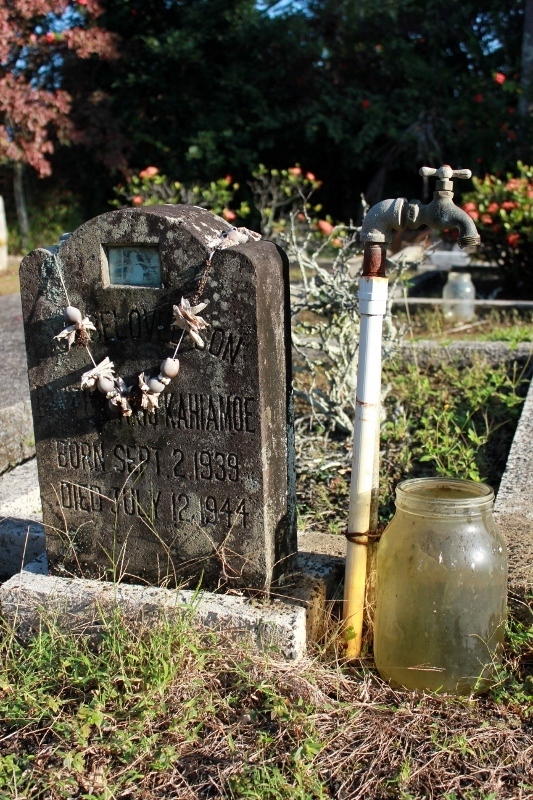 Most travelers will take the 53 mile road to the town of Hana, then turn around and head back the same route they came. But, our adventurous travel plan was to do the continuous loop. All in one day. Even the unpaved, bumpy part of the road with the zigzagging turns that the tour books warn you about. We mapped our route, left Paia at 8:30 in the morning and made a whopping 17 stops along the Road to Hana, 8 more stops than we made while driving Nova Scotia’s Cabot Trail. That’s a lot in one day! Be warned—Most stops don’t have signs, so the guides and maps refer to their location by the mile markers they can be found at. Counting mile markers makes it even more tricky than driving the switchbacks, so be very careful! 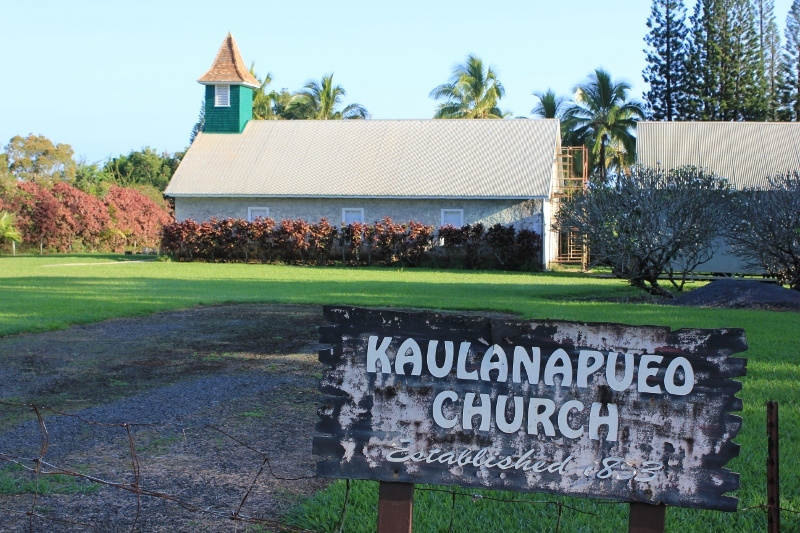 The very first stop on the Road to Hana was the Kaulanapueo Church built in 1853. 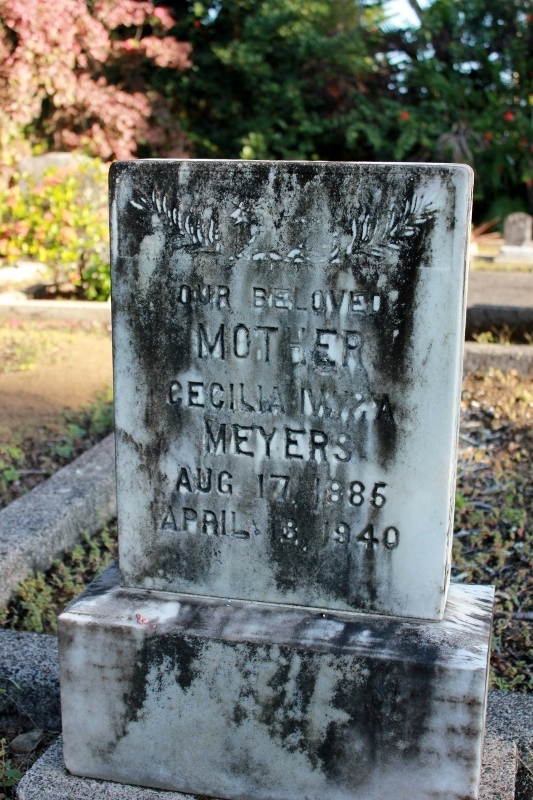 At 8:45 in the morning, we were the only ones there, besides the spirits buried in the quaint cemetery, some dating back to 1940. The Protestant churches doors were locked, but the stop was worth a peak around the grounds. 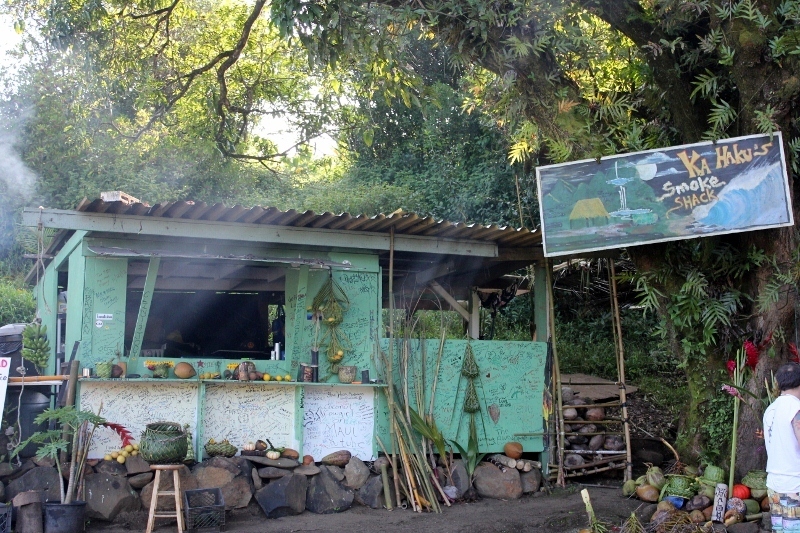 Early on the Road to Hana drive we decided that a fruit smoothie would be in order and one of the first stands was Huelo Lookout. I ordered a banana bliss smoothie, which was made with fresh papaya, coconut and bananas. If those ingredients don’t say Hawaii, I’m not sure what does. 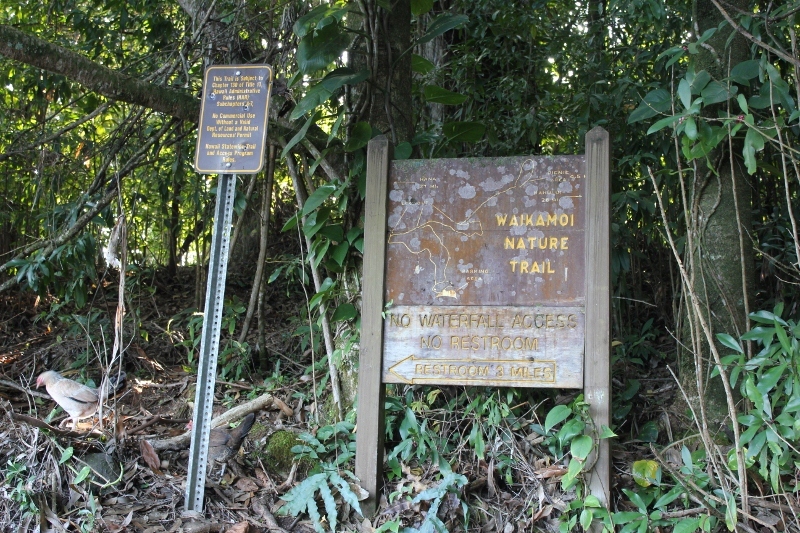 The Wailamoi Nature Trail is an easy loop hike filled with ferns, tall trees and scenic overlooks. There are two hiking options; the long route and the short. With our limited time on the Hana Highway we took the shorter of the two which was just under a mile. 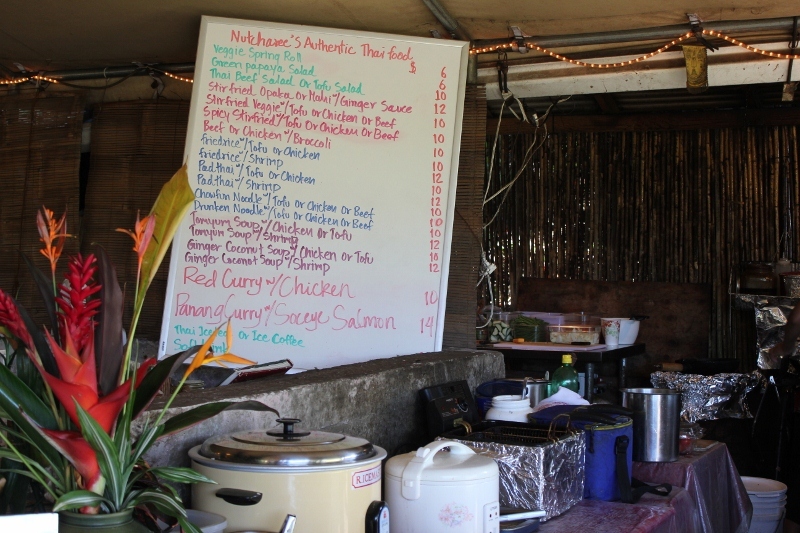 Ka Haku Smoke Shack is one of the funkiest food huts along the way to Hana and the ten buck chicken plate comes with a free coconut. Don’t bother with the canned corn and rice sides that come with it. 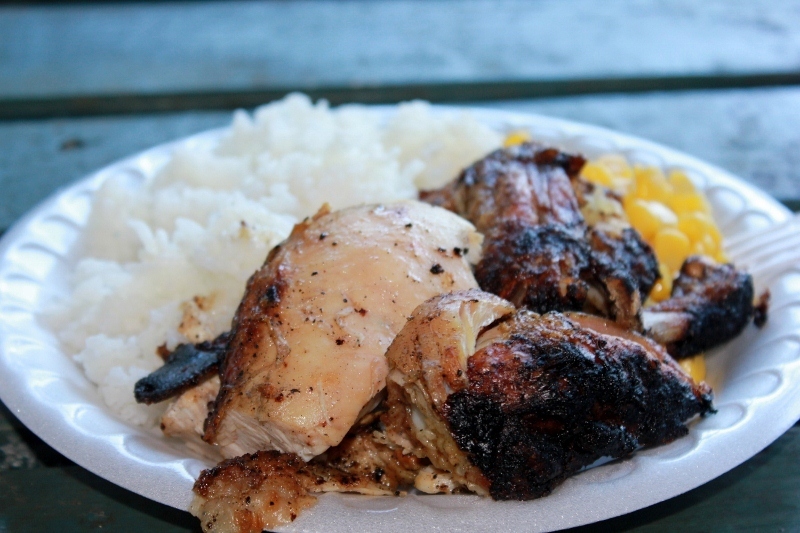 But the chicken, that is grilled right in front of you, is tender and flavorful. The fresh coconut juice washed it all down nicely. 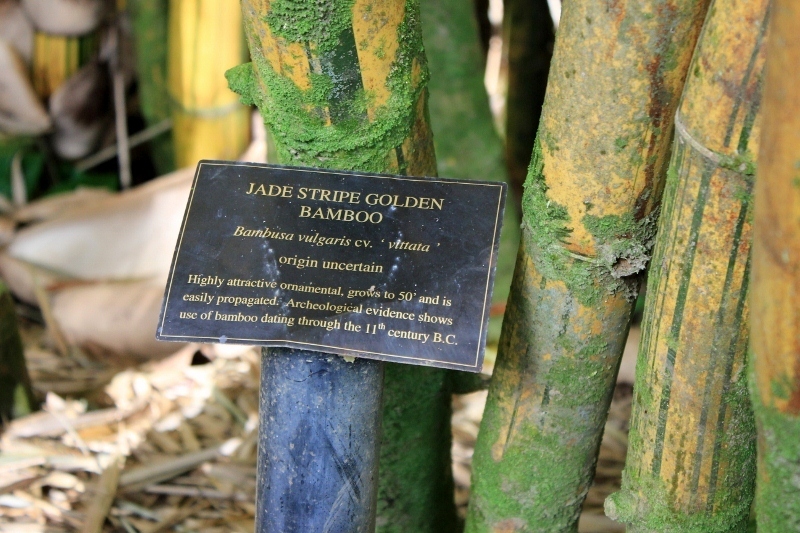 The Garden of Eden is one of those pricey, touristy arboretums that I would typically pass up, but it is a great stop for identifying all the local plants that you will see during your Hawaiian travels. Plus, they have a couple of waterfall lookouts. 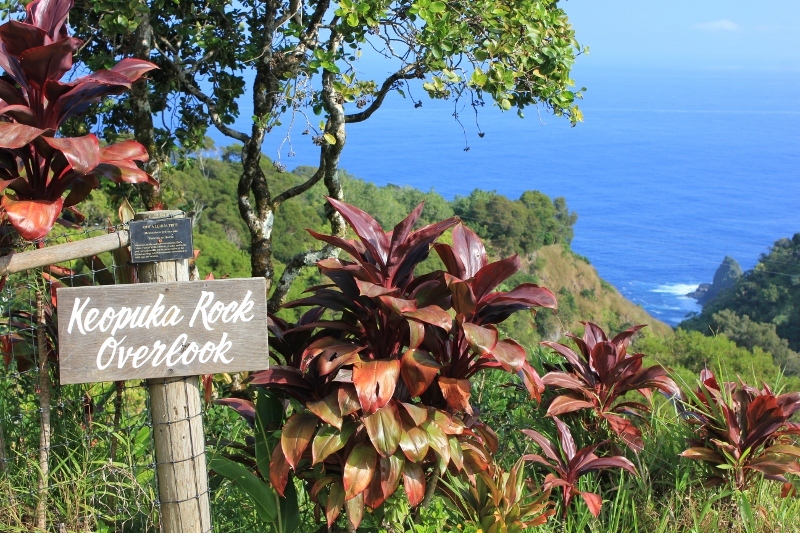 Just like the guidebooks say, there is a waterfall lookout at lower Puohokamoa Falls, but what they don’t say is that it has a no trespassing sign. The wire fence has a good size opening, where visitors have disobeyed the signs. I am not suggesting that you do the same. But, it was only a couple minute walk for a faraway waterfall glimpse. The waterfall can more easily be seen inside the Garden of Eden. 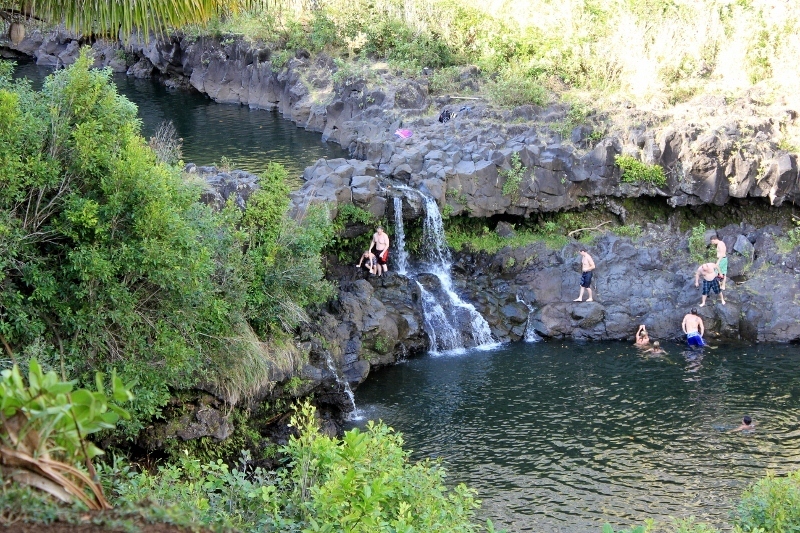 Ching’s Pond is a popular swimming hole that many people pass by without even knowing it is there. 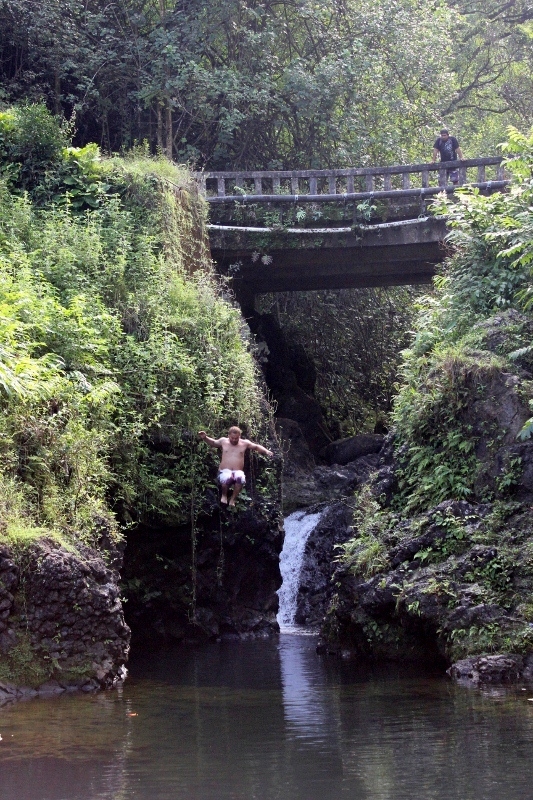 The brave locals cliff dive from the bridge, a 25 foot drop. The less adventurous leap from the lower portions or simply watch from the sidelines. 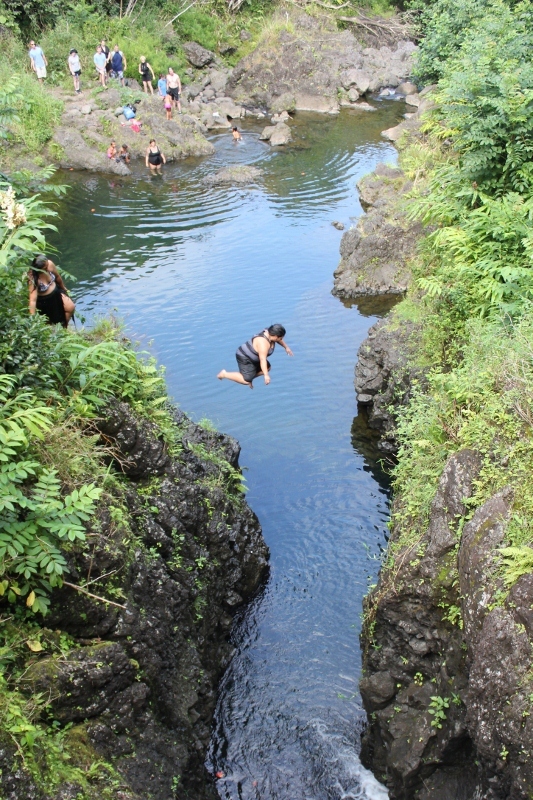 Jumping is absolutely, positively not recommended, but at that time not taking the leap was also one of my Road to Hana regrets. Not sure I’d be so brave today! 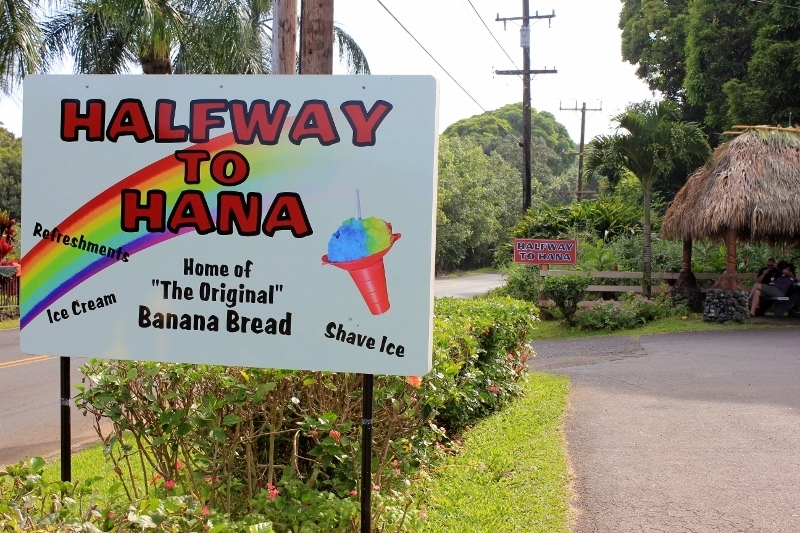 The Halfway to Hana snack shop is certainly one of those places popular due to its name and it will probably not be the best banana bread along the way, but worth the stop just to say you’ve been. Almost like Italy’s Leaning Tower of Pisa. 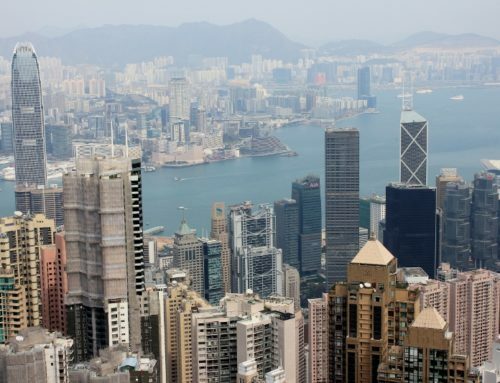 A place to stretch your legs and get a killer view! 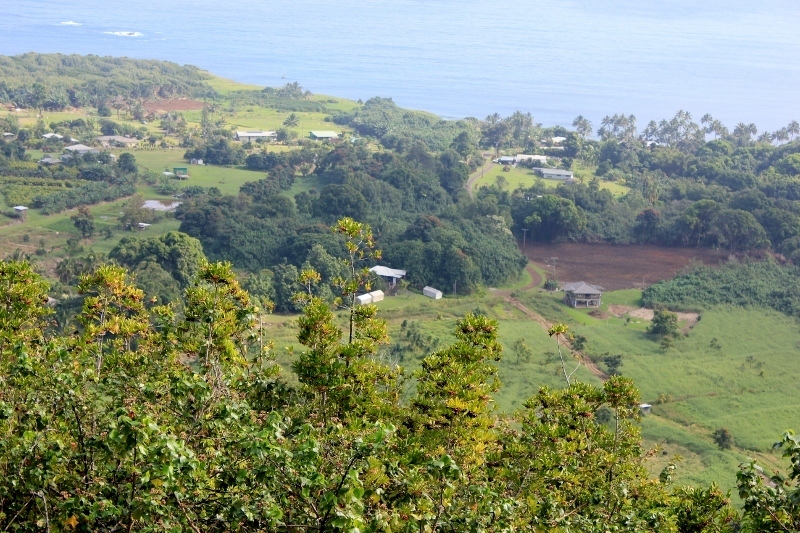 We took the stairs on the right of Wailua Valley State Wayside to the top and were treated to a view of Ke‘anae Valley, Ko‘olau Gap and the village of Wailua. It will be a quick stop, but worth the perfect Hawaiian view. 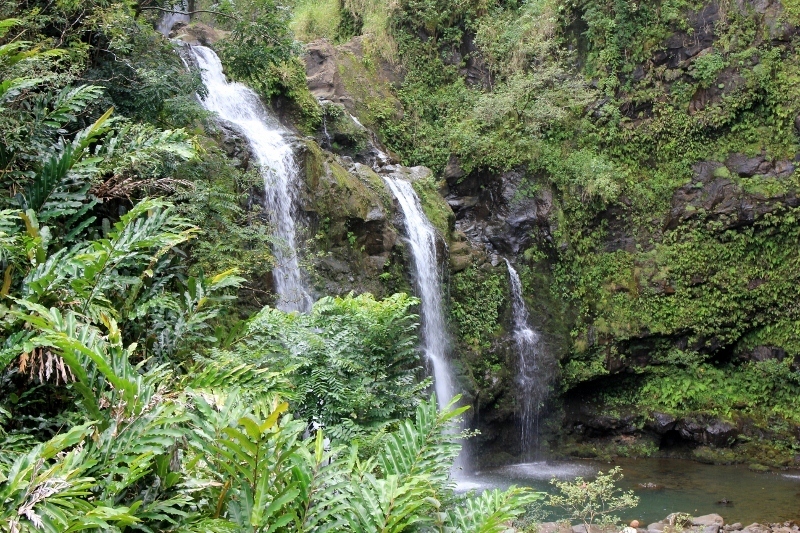 The Upper Waikani Falls is also known as Three Bear Falls and is one of the most popular waterfalls of all the Road to Hana stops. It’s a quicky, right on the side of the road. 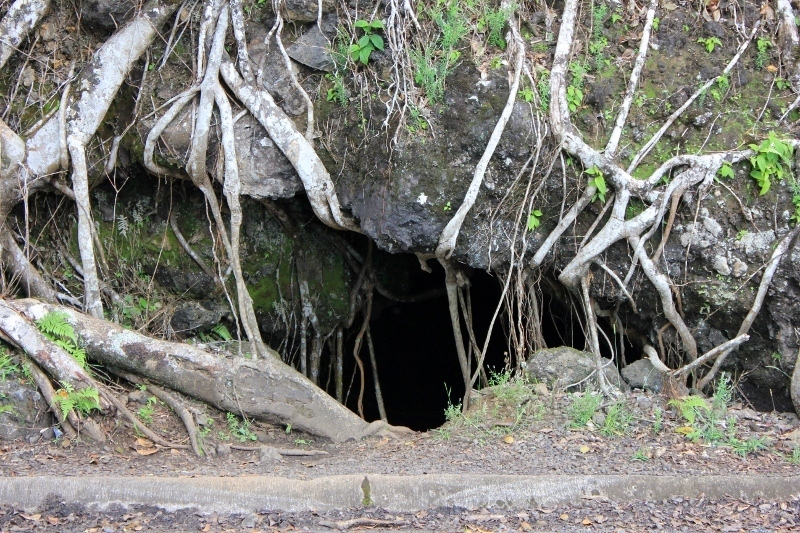 An if-you-blink-you-miss-it lava tube can be found on the right side of the road after mile marker 23. This 140 foot cave takes some stooping to enter, but that didn’t stop me. Not much in there, but at least I can say that I was. 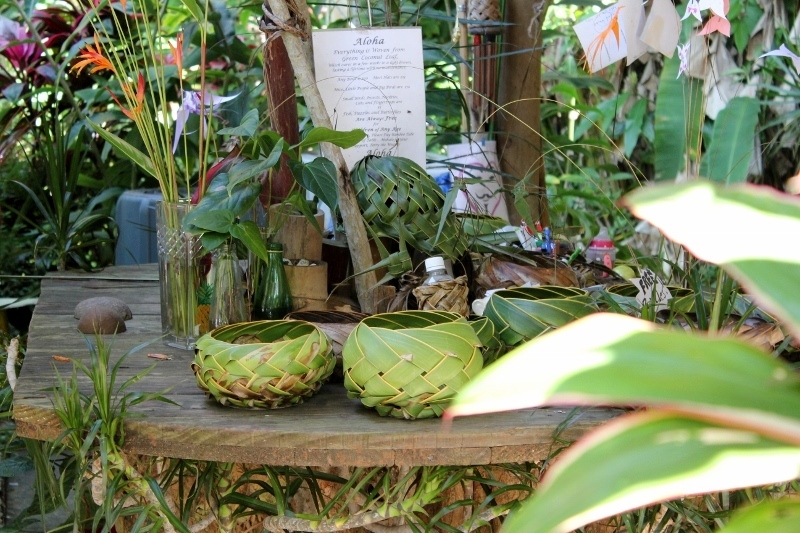 Nahiku Marketplace is a Hana shopping center, which consists of a tiny handful of Hawaiian product shops. This is where I discovered one of my absolute favorite Maui treats, coconut candy. 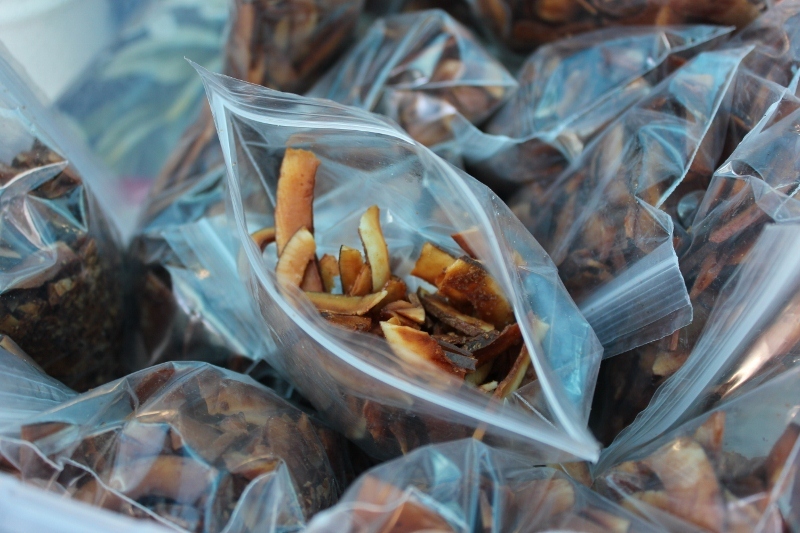 The coconut is hand cut, sprinkled with brown sugar and slow baked. It was well worth the $5 a bag. 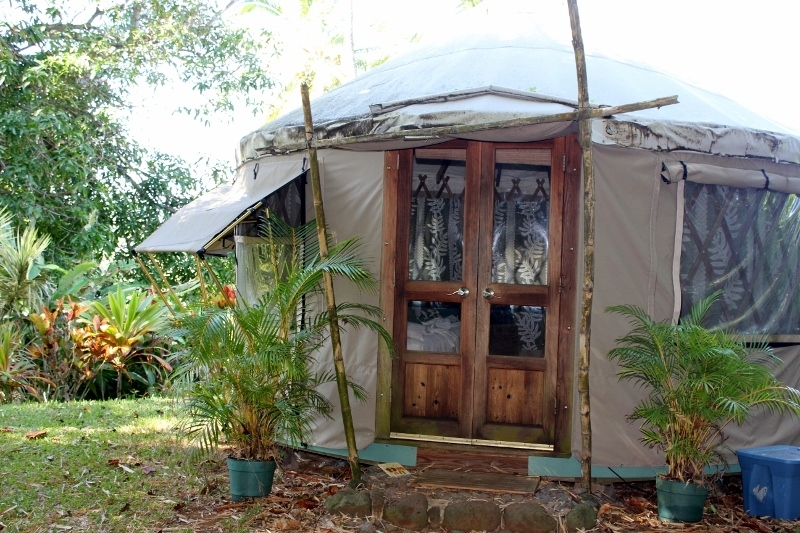 After indulging on too much coconut candy, we made a quick stop at Luana Spa Retreat to get a tour of a yurt. Why? Because I had no idea what the heck a yurt was either. Turns out it’s fancy-smancy collapsible tent commonly used in Mongolia. But, you can sleep (or, even better, get a spa treatment) in one at Luana. 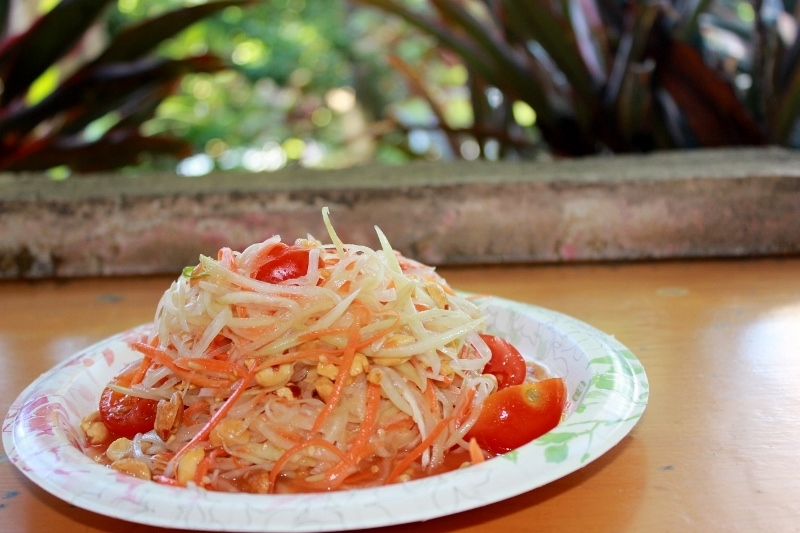 Right next to Luana Spa Retreat is Nutcharee’s, a delicious and authentic outdoor Thai restaurant. 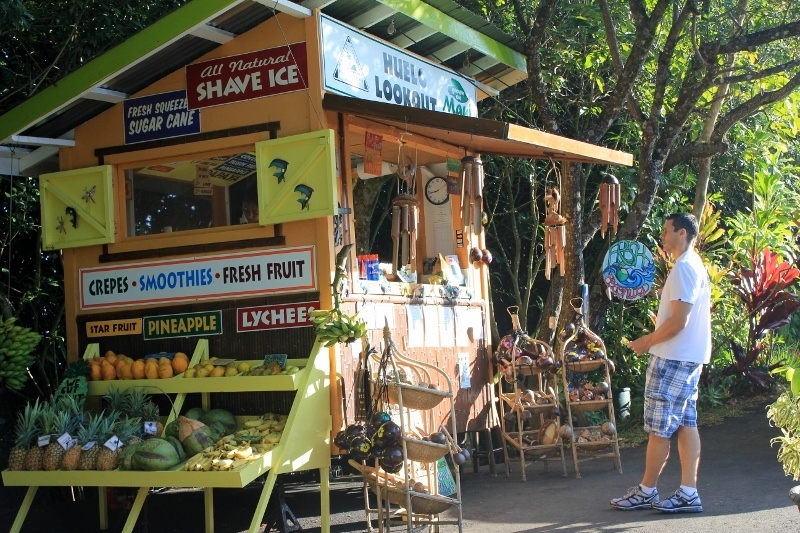 Even though it is off the beaten path of the Hana Highway, this place sometimes gets so busy it has to turn away guests. Yep, it’s that good. 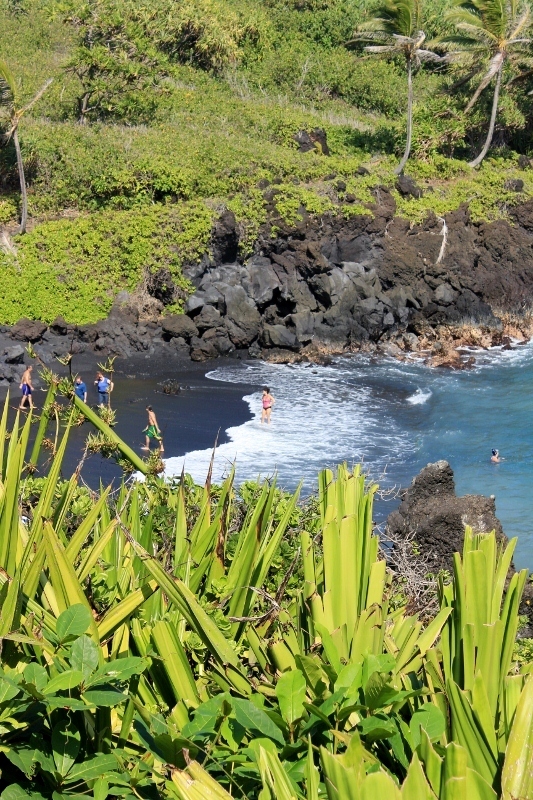 The Waianapanapa Black Sand Beach was my favorite stop along the Road to Hana. 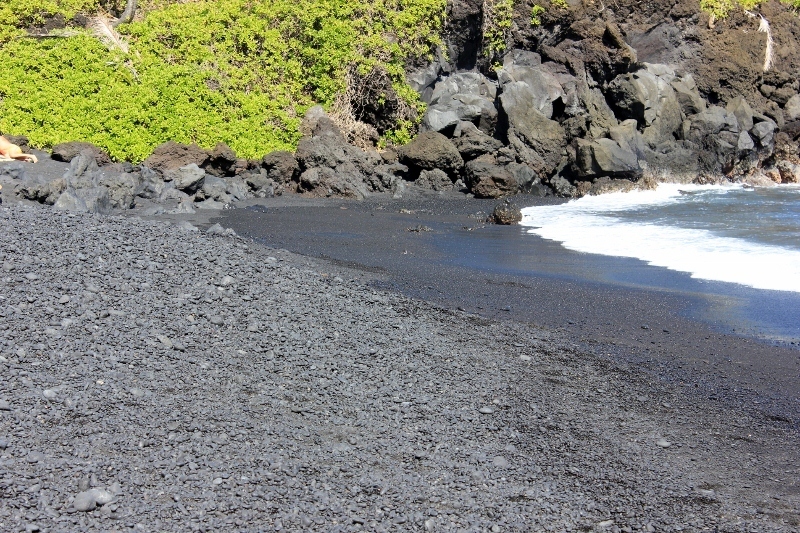 A short, yet steep, path led us to the beach which started with large coal colored rock, followed by shiny black sand with descending sizes of pebbles. Beautiful! 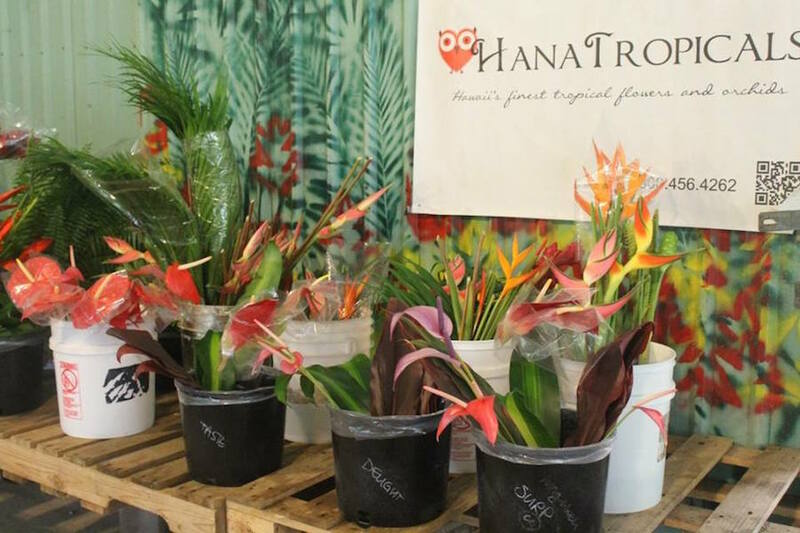 Hana Tropicals is a exotic tropical flower farm and orchid nursery located in the charming town of Hana in East Maui. The farm is an homage to one of nature’s most beautiful and distinct signatures around the island of Maui. The grounds are nestled away in a lush ethereal jungle, teeming with organic beauty. 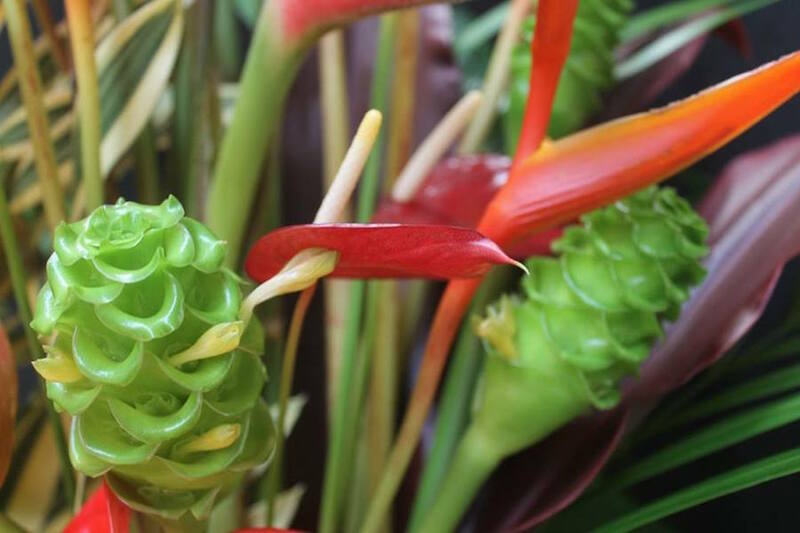 Hana Tropicals offers a free guided tour of their farm, provided by one of their young and passionate volunteer workers, or you may choose to explore the property at your own pace and interest. At his point along the Hana Highway most people turn around, heading back towards Paia, but we decided to do the full loop. Many of the tour books say that the unpaid roads are treacherous, but it really wasn’t that bad. Actually, the unpaved section was compact from so many cars driving on it. It was few miles of bumpy paved road that sucked. 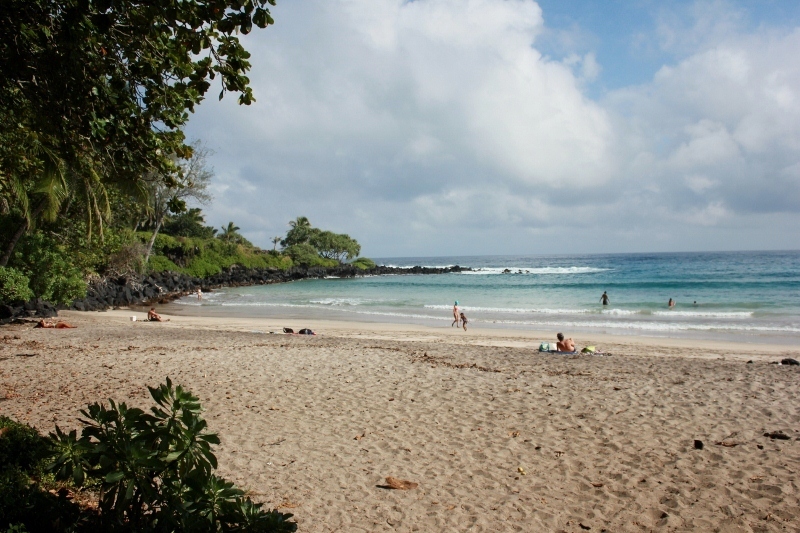 After passing the town of Hana we made a quick stop at Hamoa Beach, a beautiful, crescent public beach. We just took a peak, but would have spent more time sunbathing if we didn’t have to get back to Paia by dinner. 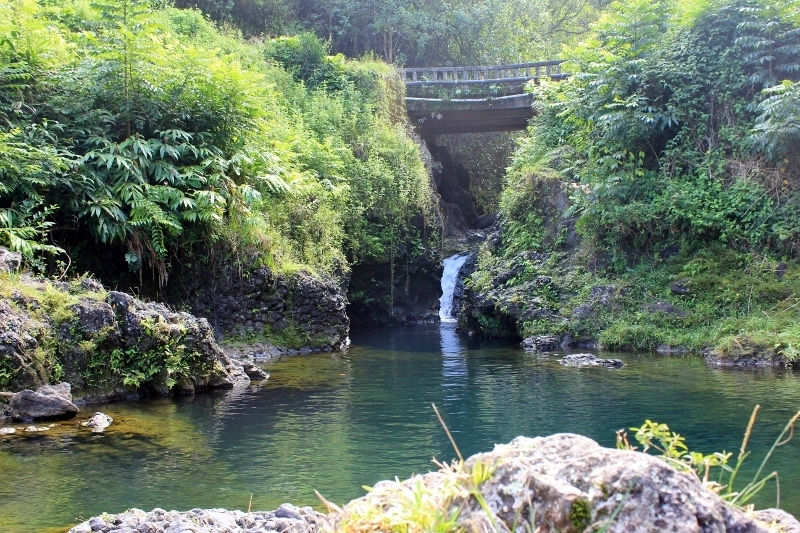 Our last stop on the Road to Hana loop was the Ohe’o Gulch, also known as the Seven Sacred Pools. 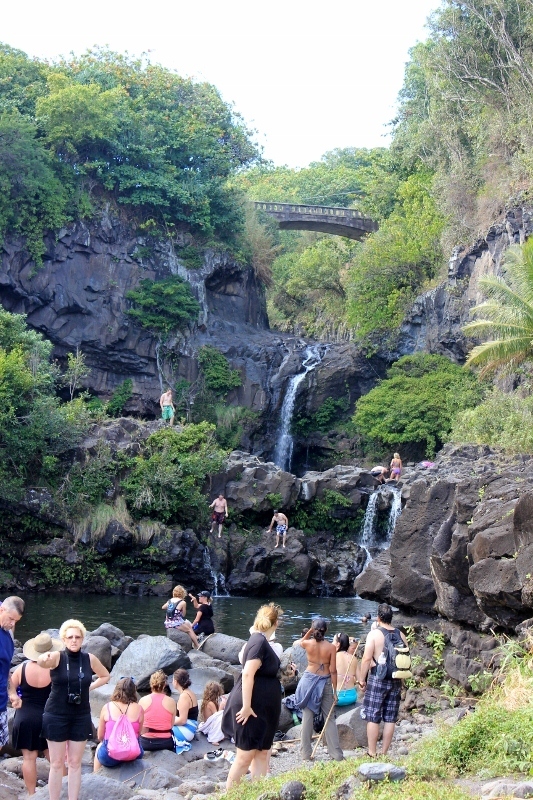 There are several falls that flow through Ohe’o Gulch and they are popular. By the time we got there, around 2:30pm, it was loaded with tourists. 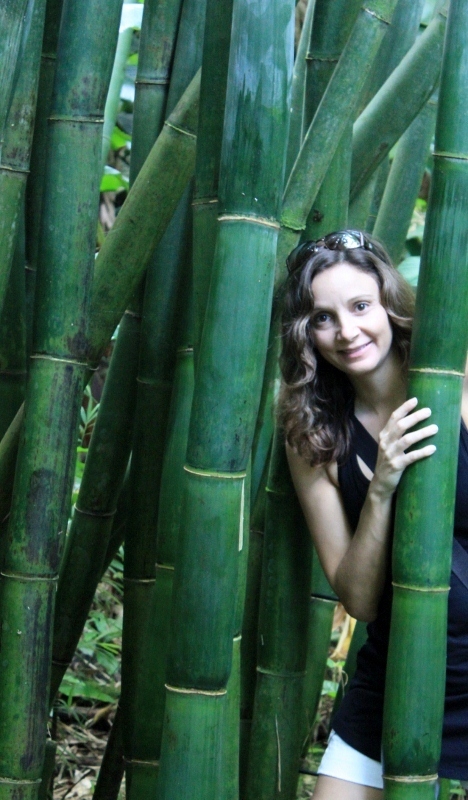 By then, after 17 of the best Road to Hana stops, the 4 mile hike (in & out) of the bamboo forest was not gonna happen. Next time. We returned back to the Paia Inn exhausted after a memorable 9 hours of adventure. 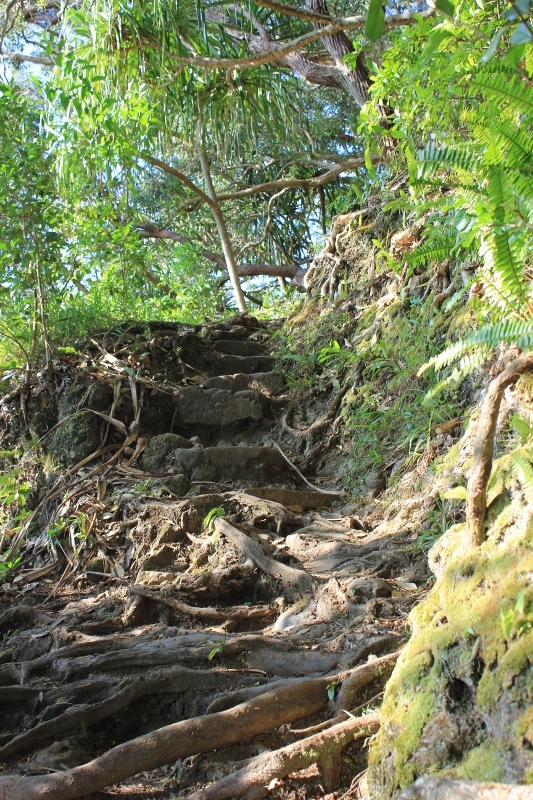 How many Road to Hana stops have you done? That's beautiful! 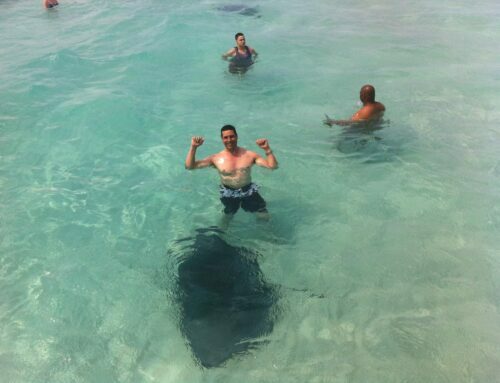 I gotta visit Maui even more now! Another island (or series of islands) that's on my bucket list is Vanuatu, it looks so good on all the pictures, I just have to go there! I have never even heard of Vanuatu. I need to Google! 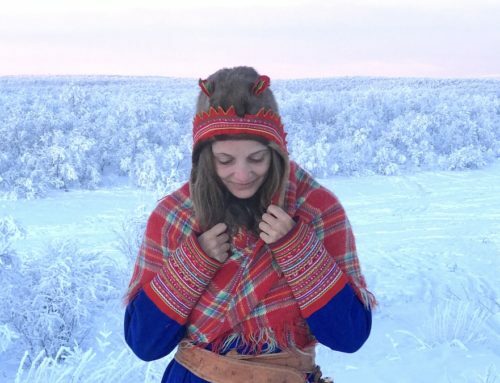 Wonderful photos, they make me want to go back so badly! I lost all our photos from our trip to Maui when my computers hard drive failed. 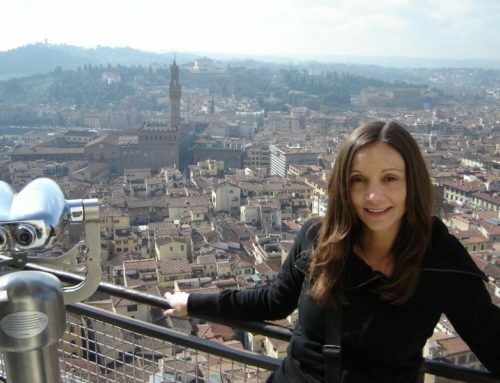 I need to go back and retrace our steps (and make several of these stops you mention that we didn't do!) We're thinking of going this fall. Did you happen to see the ice cream hut that served homemade coconut ice cream served in a half coconut shell? It was somewhere between the banana bread place and the black sand beach. I hope it's still there! I did not see the ice cream served in a coconut! And now I’m mad, because that is something I would have loved. Five years later (2018), the coconut place is still there. It is north of Ka’anapali, on the way to Honolua Bay. They are on the left (ocean) side of the highway. Wow! This post is a wealth of information. I'm motivated to make it all the way to Hana now. I've always attempted to go, but less than halfway there, we always decide to just go back. Inevitably someone's car sick. I'll keep all this in mind for my next trip to the island. It was worth doing the whole way around, but next time I’d stay the night in Hana. Gorgeous photos! I could easily spend a week….a month…..here! Thanks! I definitely could have used one more day. Gorgeous photos! I didn't know that there was so much to do Maui other than beaches. Thanks for sharing this! 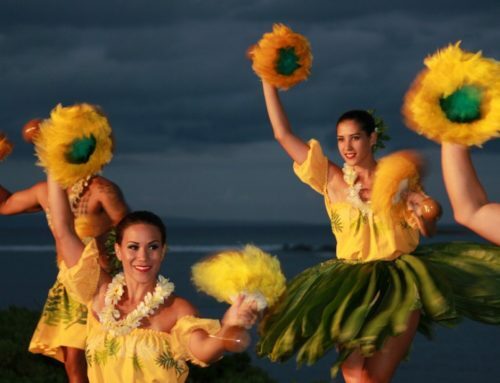 The beaches are definitely a draw to Maui, but there is so much more! Wow this post is absolutely incredible!!! Ah, I can never get enough of Hawaii!!! thats a great pic of you in the bamboo- coffee mug! Haha, I'm trying to create a life list wall of photos, it's hard to keep up with it and the frames I like are expensive….expensive when you are buying about 50 of them! I only have 1 pic up so far but one day I think it'll look quite nice! That’s a GREAT idea! I have always wanted to do a wall of framed maps from the places I have been. Send me a picture when you are done! The waterfalls are a highlight to the Road to Hana! I am definitely sending this to my friends so we can plan our road to hana trip. Amazing photos, makes me want to go there NOW. thanks so much for sharing! I am going to Maui in July and most definitely doing the road to Hana. Thanks for including your stops- I'm having a hard time deciding which ones to stop at and your pictures definitely helped me narrow down a few! 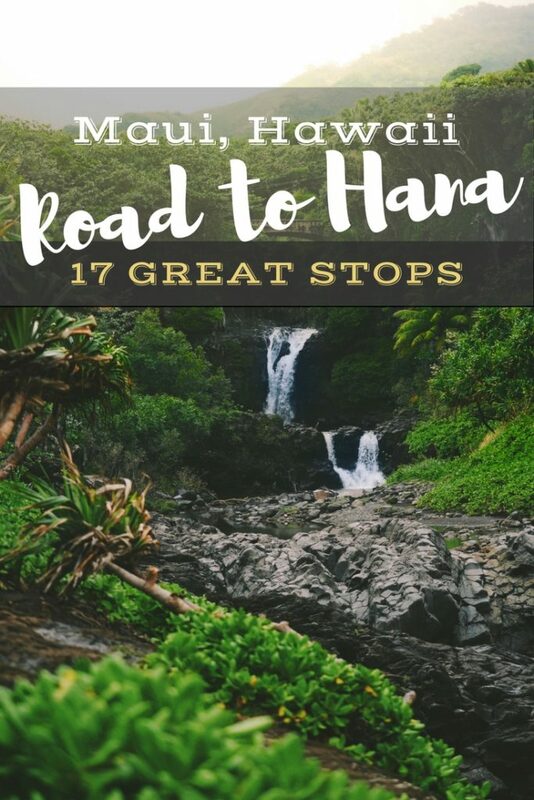 There are so many Road to Hana stops to choose from, it was really hard for me to decide too! Have a great time and enjoy. My mom and I are revisiting this trip as part of a cruise stop over. We missed so many things the first time. Thank you for your suggestions. I am looking forward to seeing all of these wonderful gems in just a few weeks! Have a wonderful time! I am jealous because the weather should be amazing and I am in 40 degree weather right now! Going in April, thanks for the information. Have a wonderful time and eat some coconut candy for me! There is a Thai food hut at mile 28.8 now next to the Hut that sells the Coconut candy. I’m not sure if it is the same owner as the one at 32 which I did not see but her food was INCREDIBLE! I am here in Maui now and we’re planning on doing the Road to Hana tomorrow! Let’s do this! Thanks for the tips! Have a great time and eat some coconut candy for me!! If you didn’t do the red sand beach, it’s a must stop on your next trip. A bit difficult to climb down to but one of the most beautiful beaches I’ve ever seen! Hoping you can help me/us. I have always been under the impression that the famous part of the road to Hana was the East coast and the unlaced part ran along the north side of the island. We are going in June and booked two nights in Hana (!) because we wanna see the island. Not the hotels and tourists. Could you advise us? And also, have heard there are rainbow ecalptus along the road somewhere. Know anything about that? Thank you SO much! I had not heard of the rainbow ecalyptus! But, it looks like they are in the Painted Forest right before mile marker 7 on the left side of the road. They are on private property and parking is tough, so be careful! 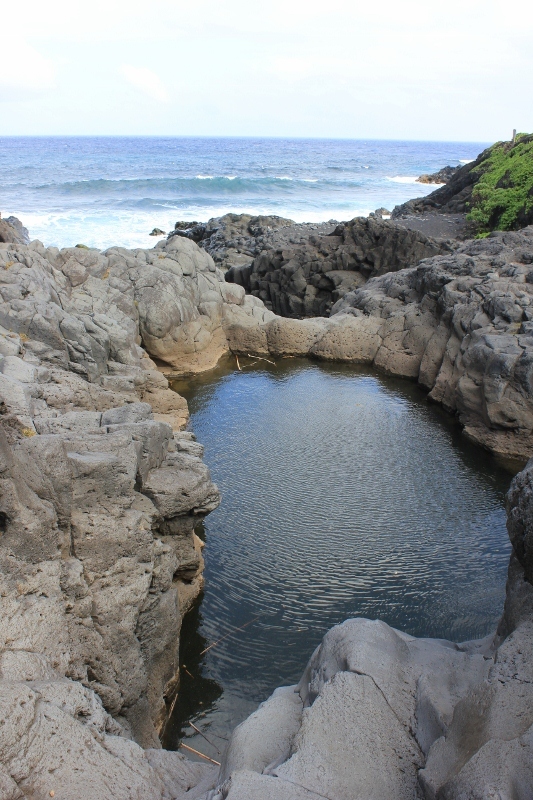 Most of the stops are located to the North & East and a little to the southwest of Hana. There are some sporadic stops further west and looping back north, but not as often as the other areas. 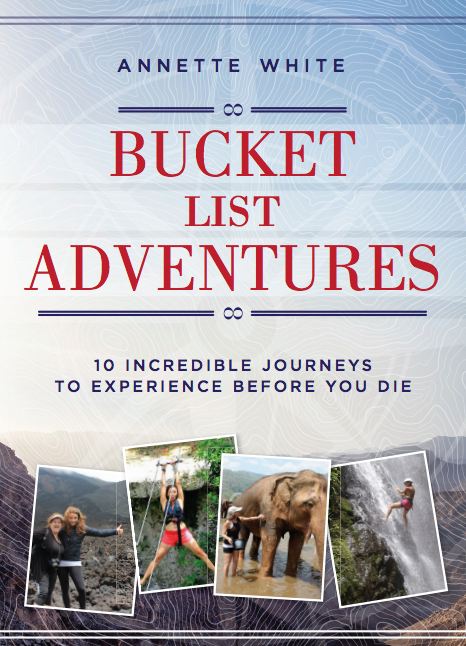 Maui Revealed is a great book to help you out with your trip! Have a GREAT time! It is people like you and comments like this that are the bane of our existence. Number one. 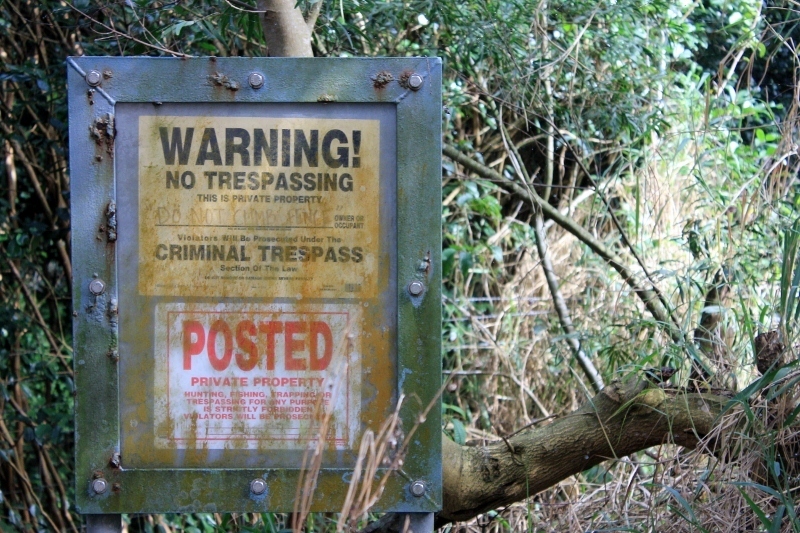 NO TRESPASSING MEANS NO TRESPASSING!! Respect these signs. As do No Parking Any Time. There is a place to park above Waikani Falls and you can walk down to take all the pics you want. Half-way to Hana does have the best banana bread and their beef jerky is the WORLDʻs BEST!!! The signs are there for your protection. Flash floods come without warning and an illegal entry means no liability. 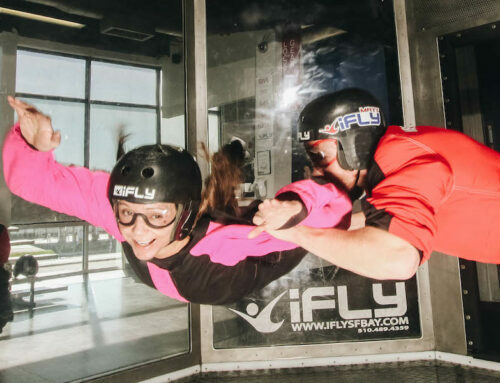 Itʻs a bumpy ride down to the Pacific Ocean and you might never be found. Annette White Maui revealed is a terrible book that causes visitors to violate sacred sites, put themselves and others in danger and trespass and you wonder why the local people resent the visitors. Thanks for your input. You are obviously very passionate about Maui and I can understand why, it is truly an amazing place. I certainly was not trying to be the “bane of your existence” by trying to highlight all of its wonderful qualities in this post. I can agree with you about the liability of trespassing and would love to add into my post the alternative parking above Waikani Falls. 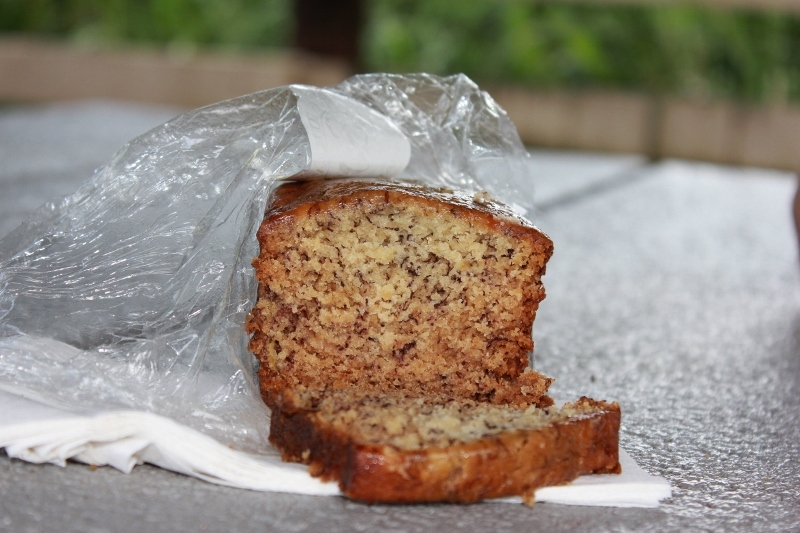 Though, I’m sticking with my personal opinion that Halfway to Hana does not have the best banana bread. Judged by the amount of traffic they get, I’m sure that you are not the only one that disagrees with me. We drove our own vehicle. It rained buckets as we started the journey but we were still able to enjoy the beauty of the trip. Once we continued on the sun came out and more beauty unfolded before our eyes. It was the most peaceful trip ever. We were celebrating our 30th Wedding Anniversary. This day was amazing! What an amazing way to spend your 30th Wedding Anniversary!! We are planning to visit Maui in a month and, like you, we would like to drive the entire loop around the eastern portion of the island. We plan to rent an economy vehicle. Can we do the entire loop – especially the unpaved and bumpy portions along the southern end? Any advice would be much appreciated! You will need to check with your car rental company—some are not a fan of you taking the car on the unpaved sections. wonderful! killer views and waterfalls, such an imaging destination for tourist. Your photos and description make it all perfect. Hana is an amazing place. 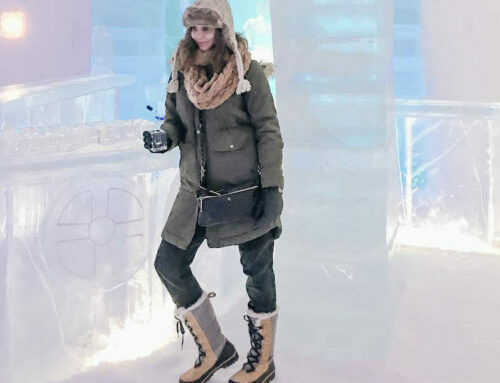 To know about more such a place you can see blog post of brave women travel. We are going to Maui in a few weeks and we plan to take the drive! Looking forward to this. Thanks for the pointers!